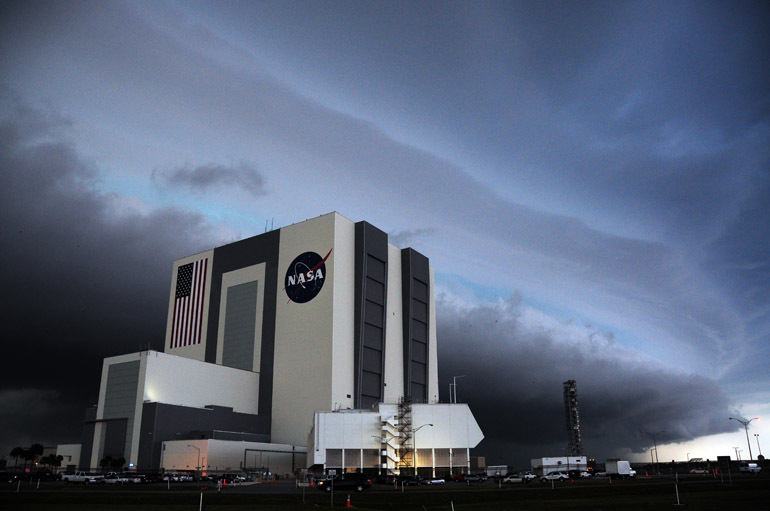 In this panorama, a shelf cloud from a severe thunderstorm moved over the Vehicle Assembly Building, delaying the retraction of shuttle Endeavour's rotating service structure. 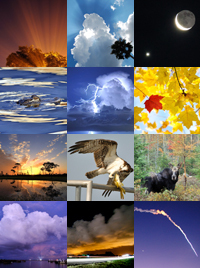 See full version here. 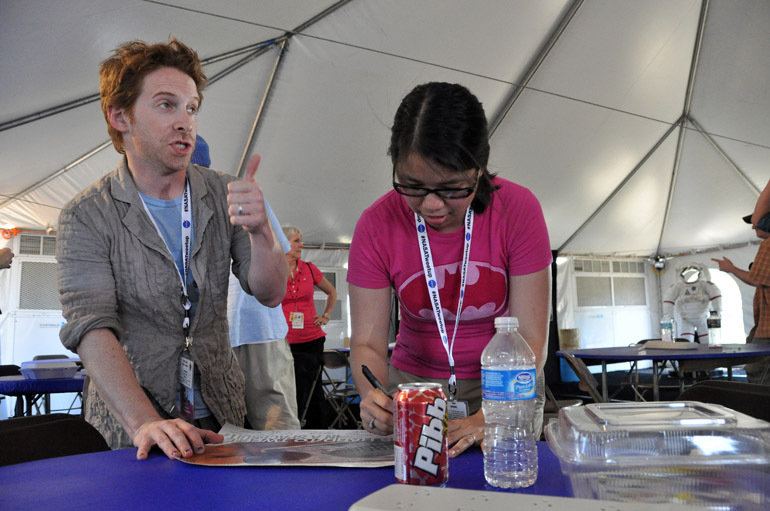 Celebrity "tweep" Seth Green watched astronaut Clay Anderson. 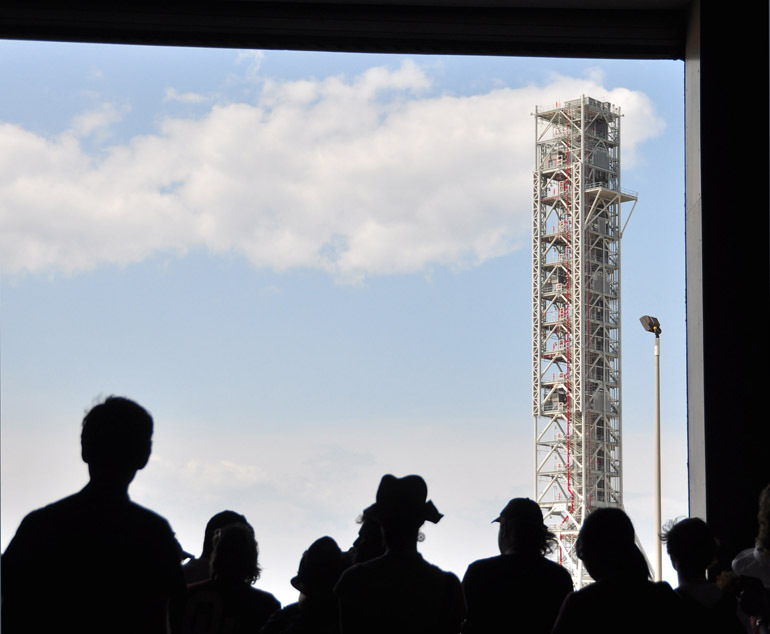 On April 28 and 29, I had the privilege of representing my employer, the Florida Today newspaper, at NASA's "tweetup" of a space shuttle Endeavour launch attempt. The fourth such event was an accumulation of 150 Twitter users who were randomly selected from thousands of applicants. They came from 43 states, the District of Columbia and six foreign lands. You can find my tweets at @spaceteam. 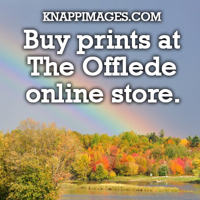 My personal Twitter handle is @offlede. 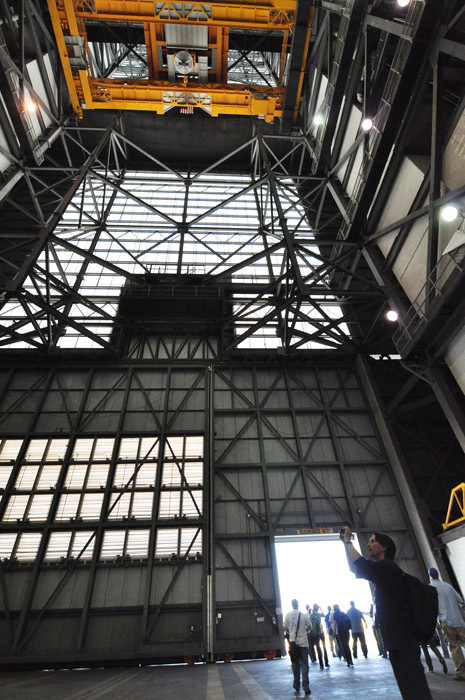 It was a chance for ordinary fans of NASA to get a behind-the-scenes perspective of Kennedy Space Center. At their base at the historic Launch Complex 39 press site -- three miles from the launch pad -- the "tweeps" listened to astronauts and scientists talk about their jobs and the upcoming STS-134 mission. 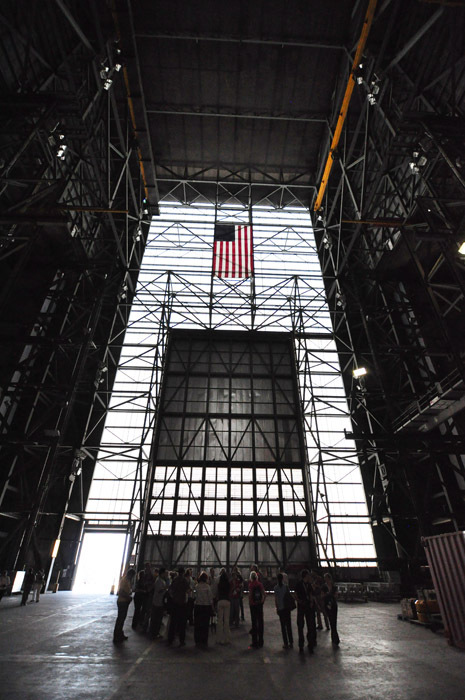 We were taken on a tour of KSC, which included stops at the Shuttle Landing Facility, the Vehicle Assembly Building and the Saturn V Center -- all free of charge, of course. We had been schedule to watch the rotating service structure be retracted, revealing the shuttle on the night before the launch. 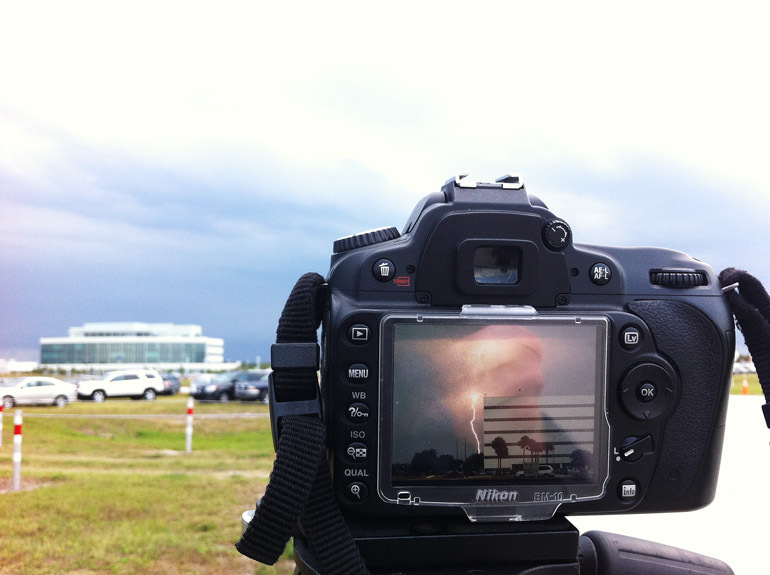 But a thunderstorm delayed that launch milestone, making it too late in the evening for the tweeps to watch. 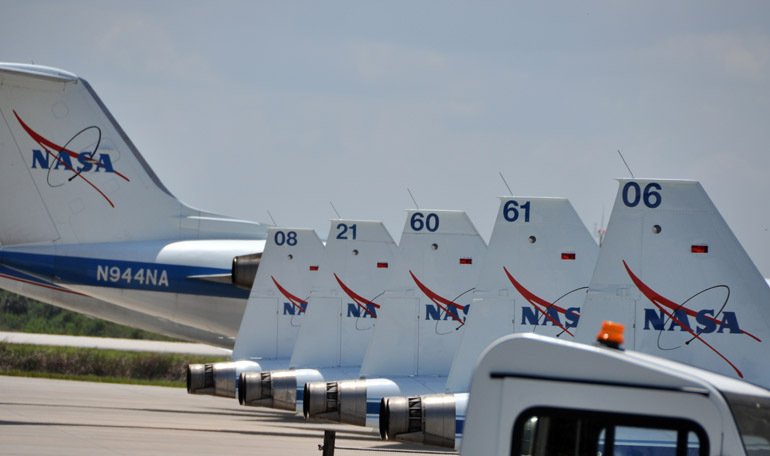 Some celebrities -- such as actors LeVar Burton of "Star Trek," Seth Green of "Austin Powers" and an actor known by many as simply "Jerry the Desk Guy from 'ER'" -- were special invitees of NASA. They mingled with the ordinary tweeps and posted similar updates to their personal Twitter feeds. 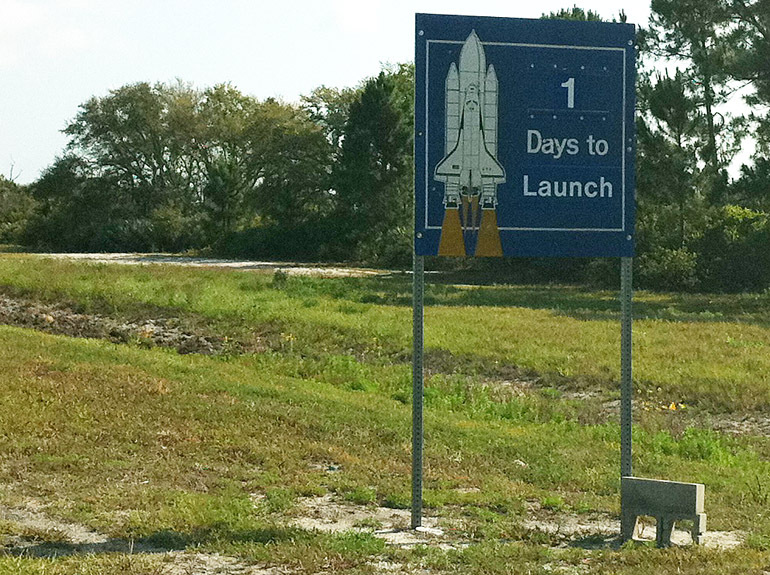 Here are some photos from Day 1, before the two-day event was supposed to be culminated with Endeavour's launch. 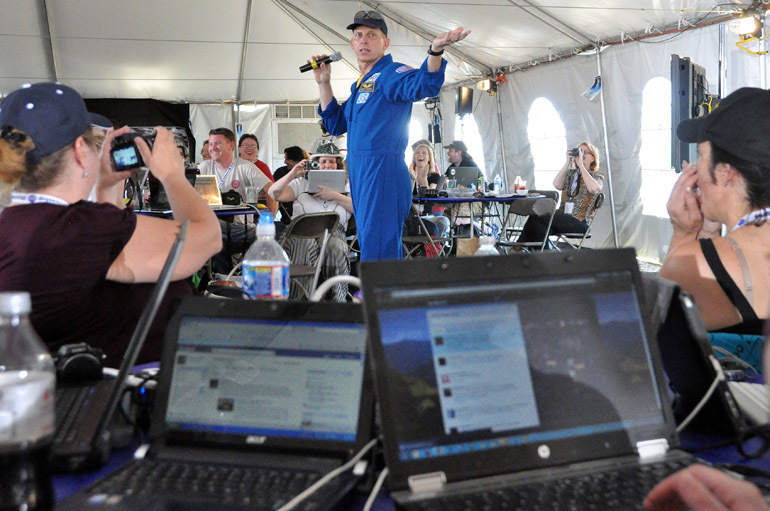 Astronaut Clay Anderson surrounded by Twitter-equipped electronics. 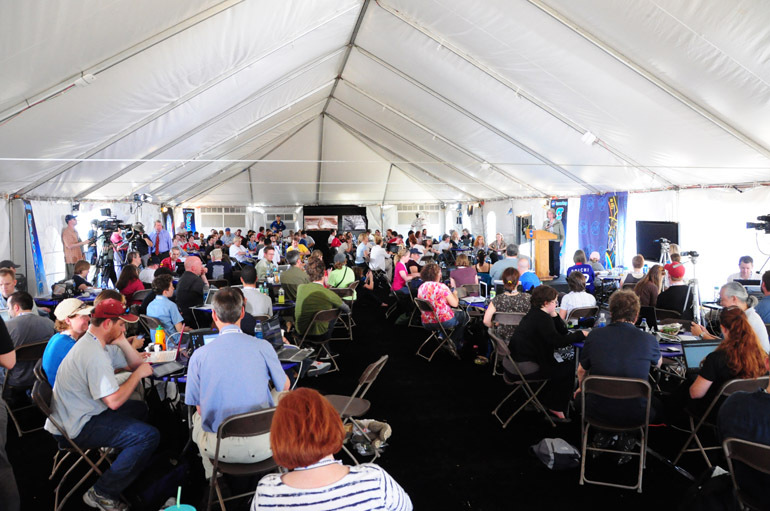 The tweetup tent at the press site was air-conditioned. 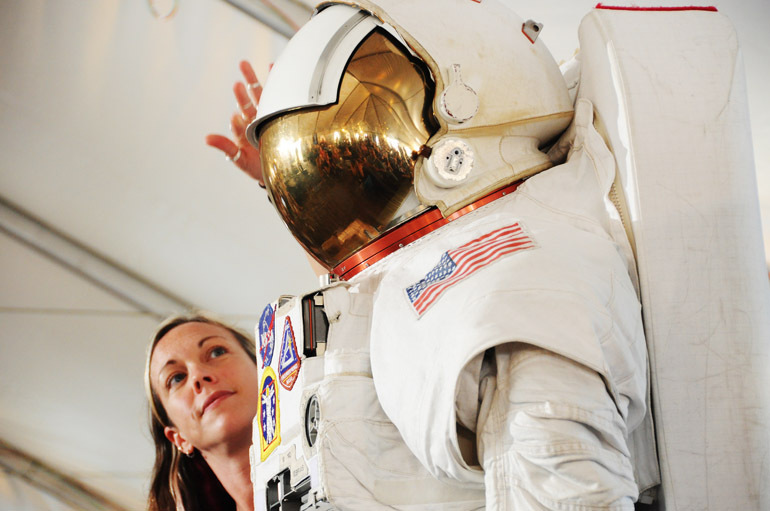 Johnson Space Center experts showed off a spacesuit, or an extravehicular mobility unit, or EMU. 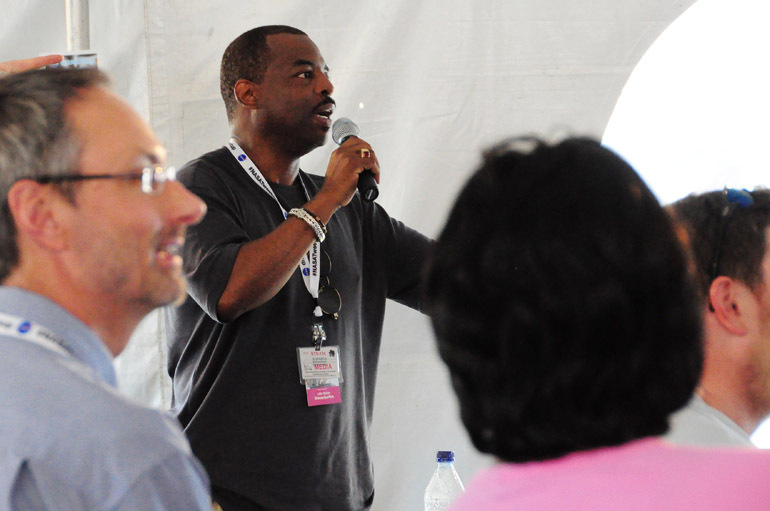 Celebrity tweep LeVar Burton of "Star Trek" and "Reading Rainbow" fame. Local tweep Julie Deily signs her own autograph for actor Seth Green of "Austin Powers" and "Buffy the Vampire Slayer." 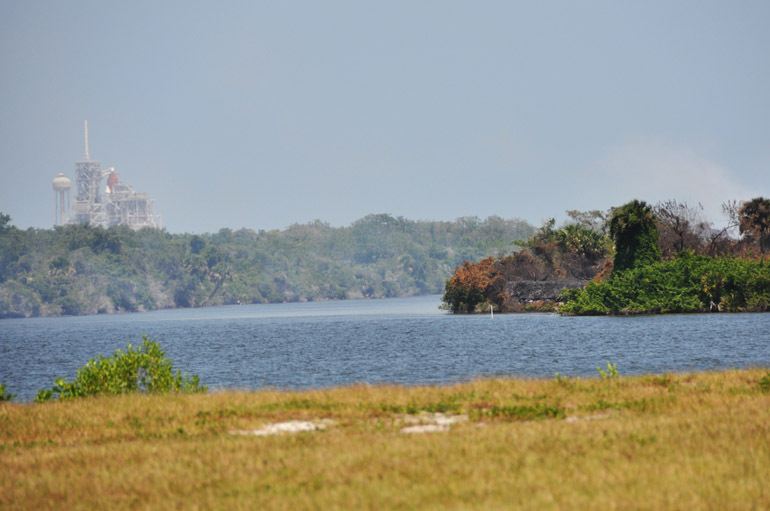 A 400-acre brush fire burned three miles from the launch pad, but there was no danger, just lingering smoke. 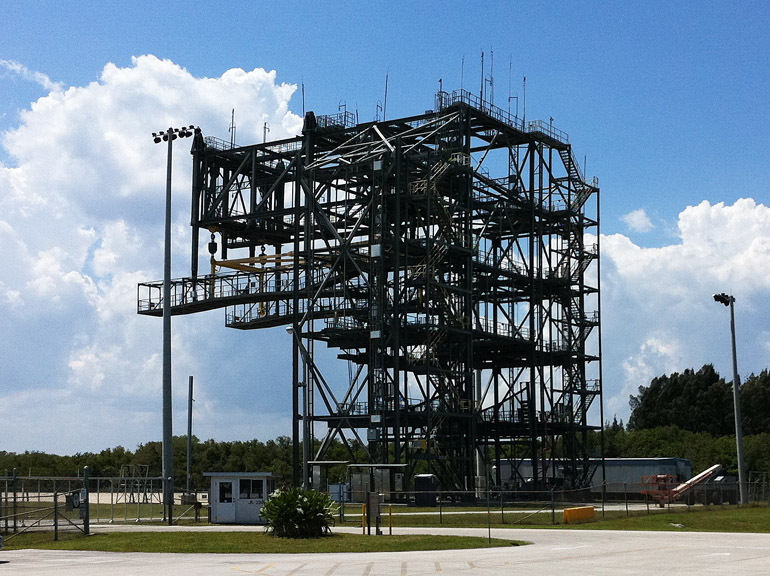 We took a tour of KSC and saw a fleet of T-38 training aircraft at the Shuttle Landing Facility. 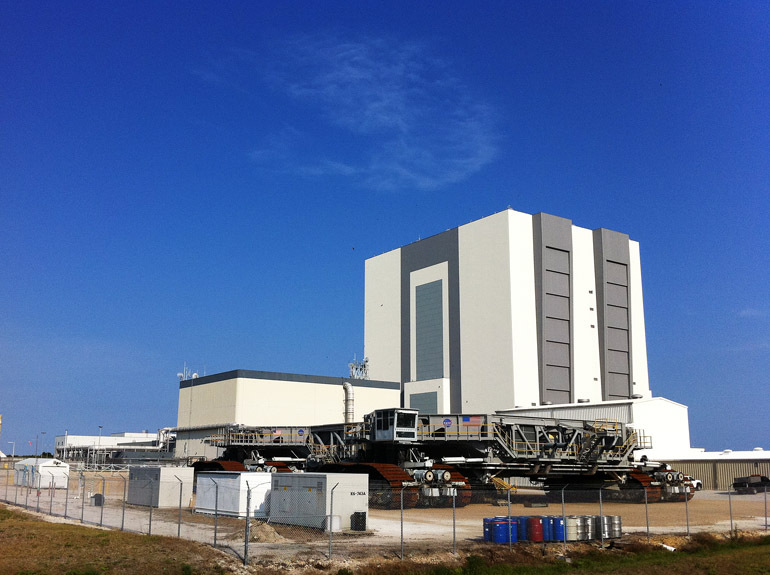 Sun bounced off the Vehicle Assembly Building, the next stop on the tweeps' tour. 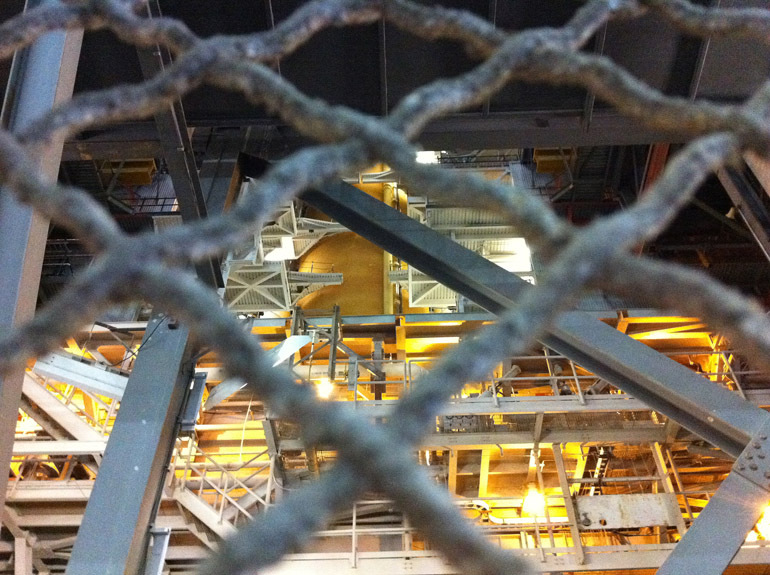 Through a VAB door, tweeps looked at a mobile launcher platform. 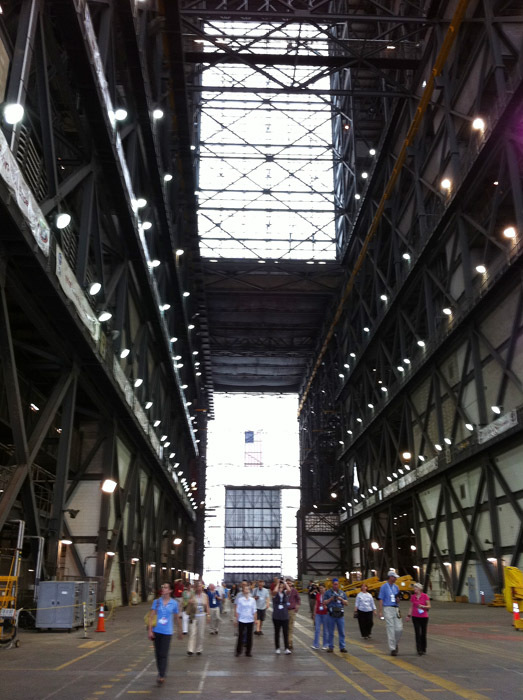 Tweeps marveled at the VAB's innards. 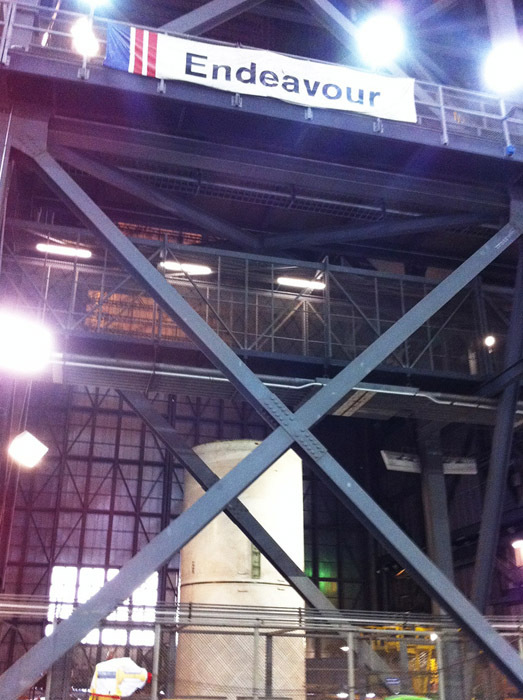 At top is a crane used to move the shuttle. Storm clouds started to build as the Gulf of Mexico and Atlantic Ocean seabreezes collided ahead of a cold front moving over Central Florida. Captured a little lightning in the distance. 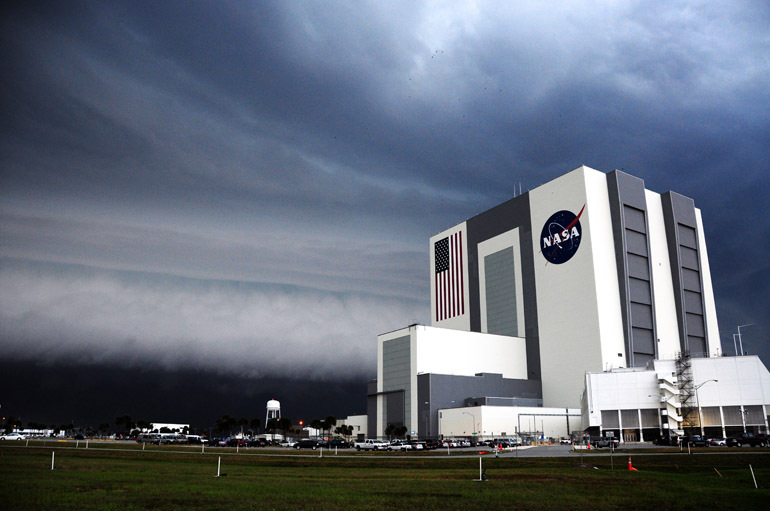 The shelf cloud began to move over the space center late in the afternoon. It was one of the most colorful such clouds I'd seen. 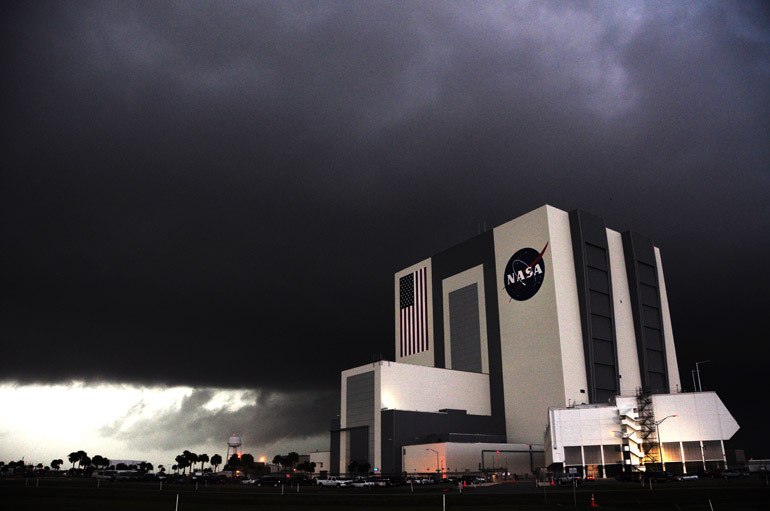 Talk about a dark cloud over NASA. 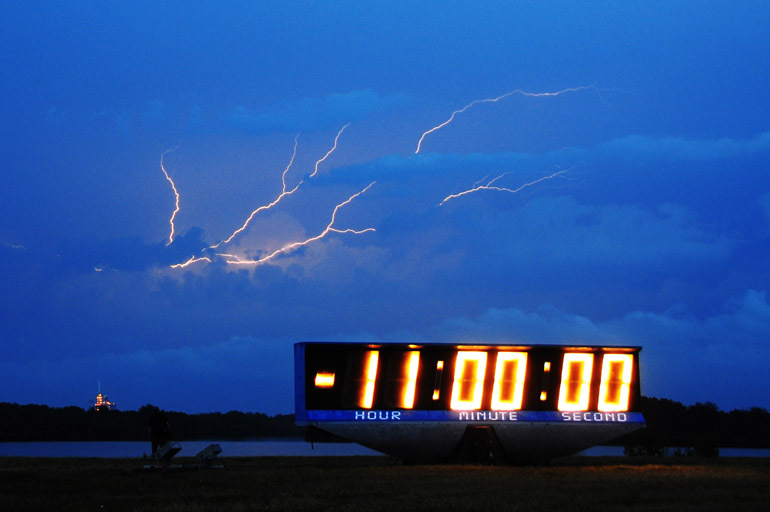 There were a few lightning "crawlers," one of which is seen here above the launch pad and the countdown clock. 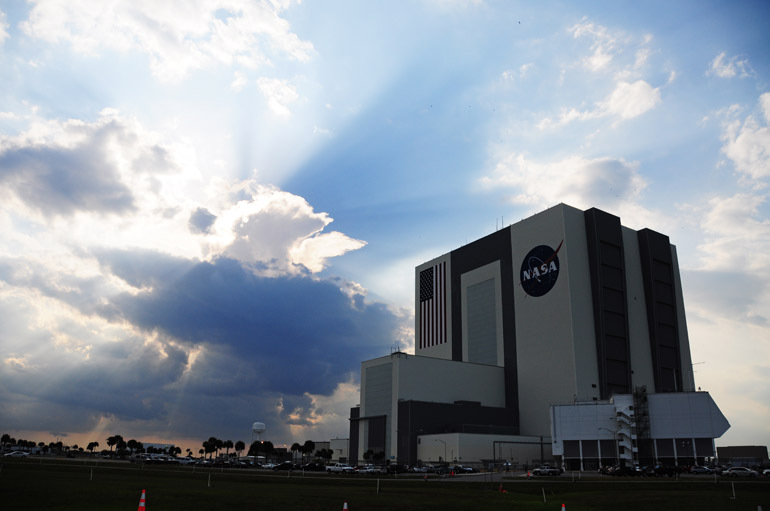 The VAB around sunset. 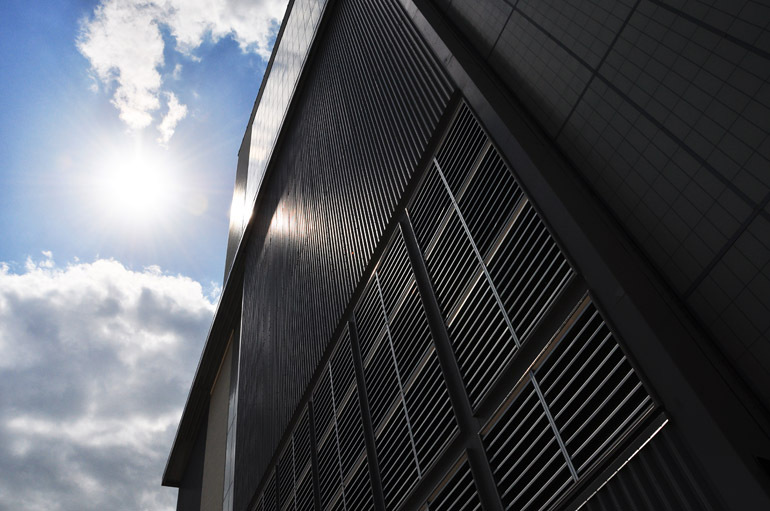 Another storm would come later, further delaying launch operations. 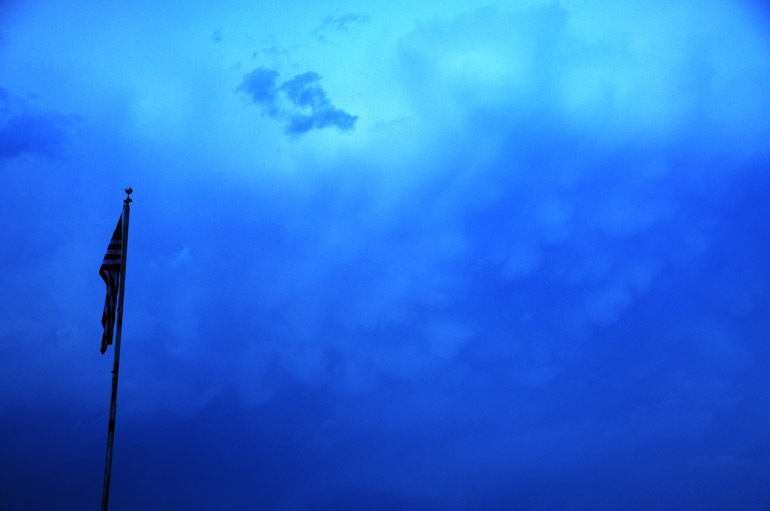 Some mammatus clouds above the historic flagpole. The weather-induced delays prevented the tweeps from making a trip to the launch pad and seeing the shuttle bathed in beams of spotlights. The one day this sign is actually grammatically incorrect. Grr. The "mate-demate device," which workers use to get a shuttle off the 747 that sometimes carries it from California. 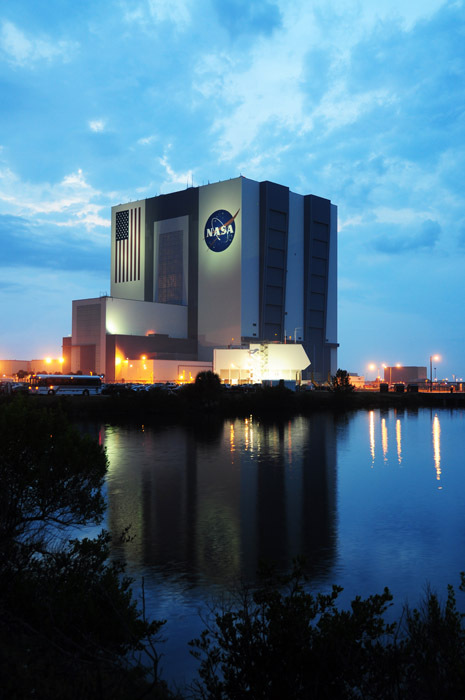 An external tank and a pair of solid rocket boosters were being prepared in the VAB for space shuttle Atlantis' final mission this summer. 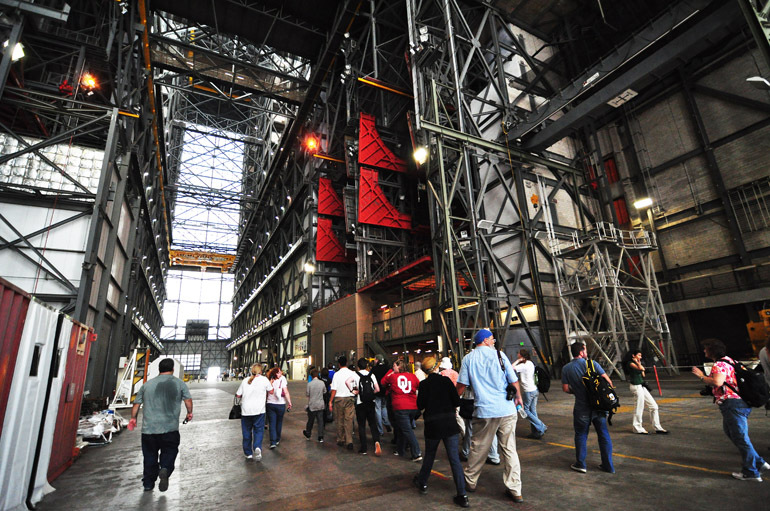 The tweeps in the VAB. Seth Green's girlfriend took a picture of the actor and our tour guide. A section of an SRB. 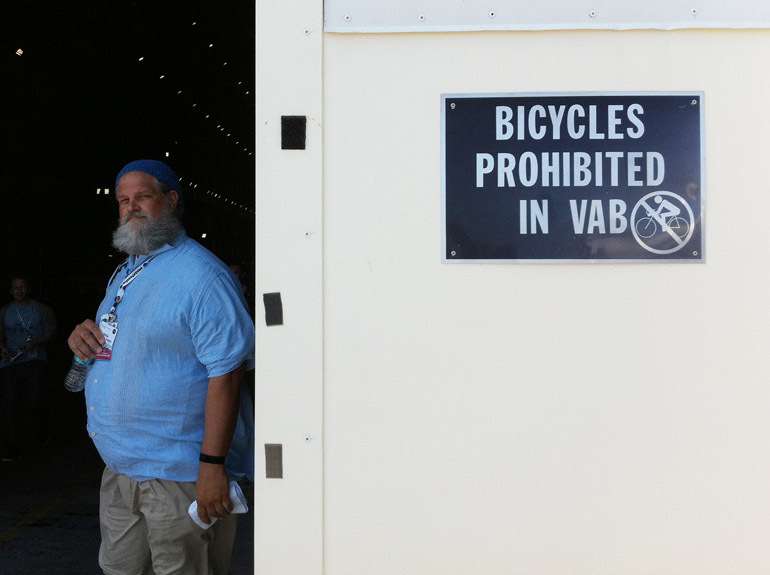 The "ER" actor, Abe Benrubi, stood next to a warning sign at the VAB. 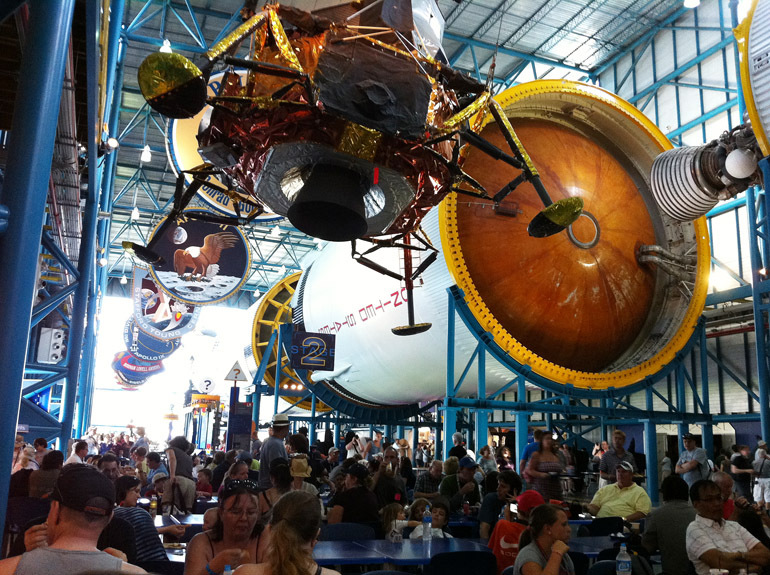 A packed Saturn V Center. 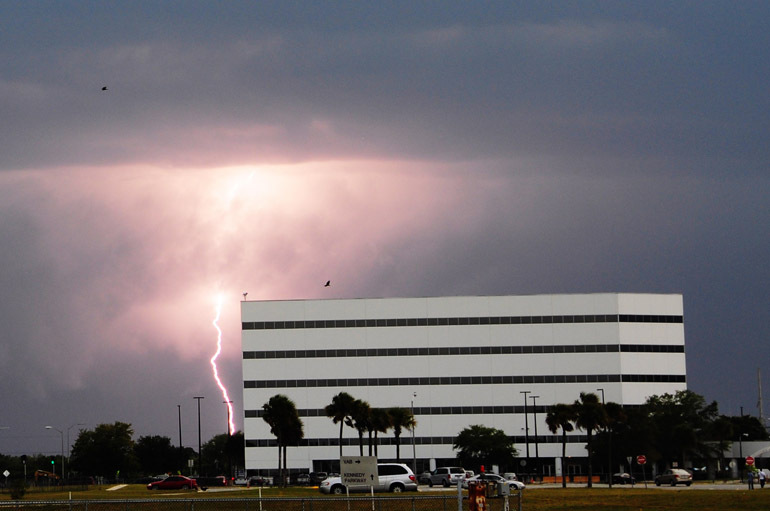 My big camera snapping pics of lightning. 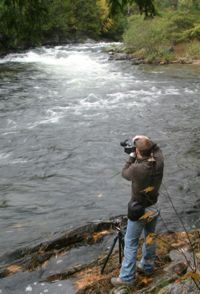 Andrew -- don't know how I missed this post originally, but it's AWESOME! 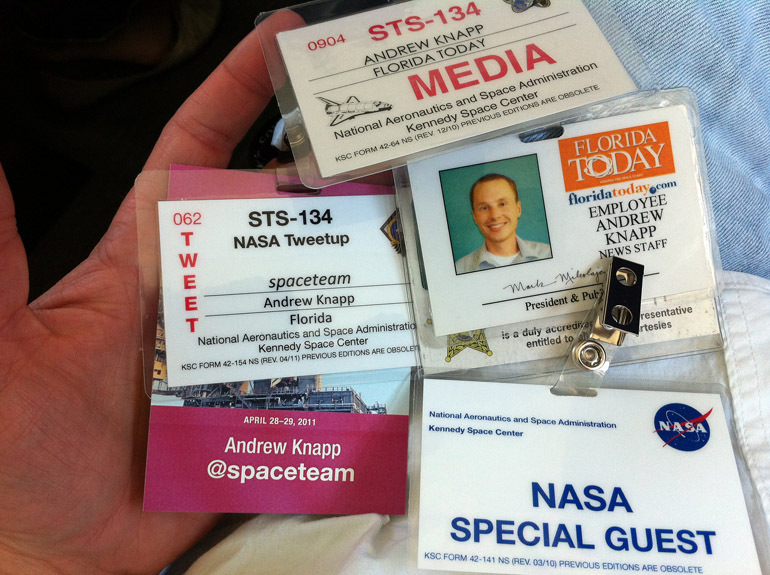 I'm a fellow #NASATweetup attendee (@kwidrick) and your pictures are incredible.